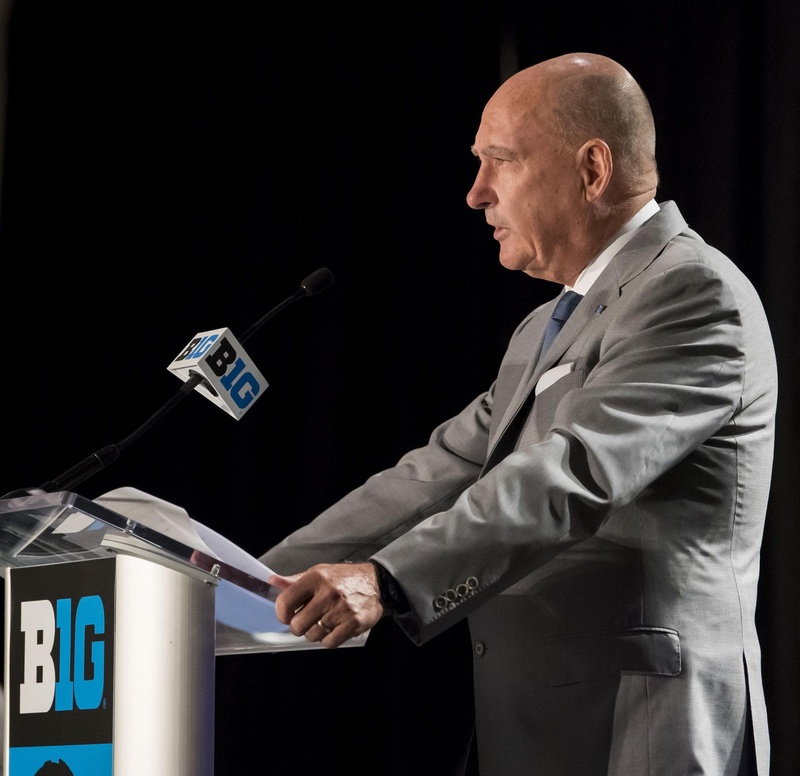 CHICAGO— On a peak summer day outdoors, the indoors proved to be as warm as Big Ten media days kicked off at the Chicago Marriott Magnificent Mile with an annual press conference from league commissioner Jim Delany. Delany acknowledged the passing of former SEC commissioner Mike Slive, coach and administrator C.M. Newton and former Duke coach and commissioner Vic Bubas, who were longtime friends and mentors for him for over 40 years. Attendance declines have plagued the majority of Football Bowl Subdivision teams this decade, but Delany revealed that the Big Ten was the only one of the power five conferences to increase in-stadium attendance last season. Delany mentioned how the Big Ten played a significant factor in ratings last season across its television partners— Fox, ESPN/ABC and BTN. Five Big Ten teams ranked in the top 21 of the final College Football Playoff rankings last season, more than any other power five conference— No. 5 Ohio State, No. 6 Wisconsin, No. 9 Penn State, No. 16 Michigan State and No. 21 Northwestern, to go along with a 7-1 bowl record. Since the Big Ten went into its current regional divisional format in the 2014 season, the imbalance between the East and West divisions have been a revolving topic. National brands like Michigan, Michigan State, Ohio State and Penn State have been in the East and have enjoyed the most success in the league as they represented all 14 top 10 finishes, while the West has been dominated by Wisconsin for the most part, but have been 0-4 in the Big Ten title game since realignment. Delany cited there has not been enough of a sample size to judge on whether or not an imbalance exists. Since going to a nine-game schedule in 2016, The Big Ten has not made the College Football Playoff, but Delany believes in the current format and continuous build of overall strength of schedule will help long-term. "I think it's related to your fan base. I think it's related to building strength of schedule," Delany mentioned. "I think it's related to getting your teams in the best possible shape for postseason. And I think what I cited earlier is that we're pretty successful in a lot of those categories. I don't think there's any doubt that playing nine games in the kind of rigorous schedule that we play makes achieving an undefeated season more difficult." The first full season of Friday night Big Ten conference games was a success for the participating schools in 2017 and will continue in 2018 with Penn State at Illinois (Sept. 21) and Indiana at Minnesota (Oct. 26). For the foreseeable future, Delany expects the Big Ten to have two Friday night conference games outside of Labor Day and Thanksgiving weekends, working with the participating colleges and potential area high schools that could be affected. “We've been able to work with the high school associations, and I think of the 93 games that were televised, I think there were two Friday games which wouldn't have been there in the past. And I think they went off fairly well,” Delany said.